like a squirrel collecting nuts for the winter. dust off cold weather kitchen toys. do all our chores in two days. *note: we used a mix. dw mentioned something about making the batter from scratch, rice flour + turmeric + a bunch of other starches and i nixed that notion. it’s a special kind of flour, used in special proportions and frankly, my interest in making things from scratch doesn’t extend going to those lengths. i’m not loyal to any brand, at least not yet. we used two bottles of beer + some water. in this instance, it was instinctive: we gauged how thin the batter was based on our experience when making with my family during summer cookouts. you want the batter to be loose, not thick like pancake, but not straight water either. it was hit or miss for us the first few we made then we got our groove. mix the bánh xèo mix with beer (or water) and stir until fully incorporated. add in the scallions. set aside. heat a non-stick pan coated with a light layer of oil on medium-high. add in a few onions and 4-6 pieces of sliced pork belly. allow the onions to sweat a smidge. using a ladle, pour 1 ladle full of batter into the pan. swirl the pan to coat it evenly, but thinly. grab a handful of bean sprouts/chive blossom and pile it on one side of the pan. 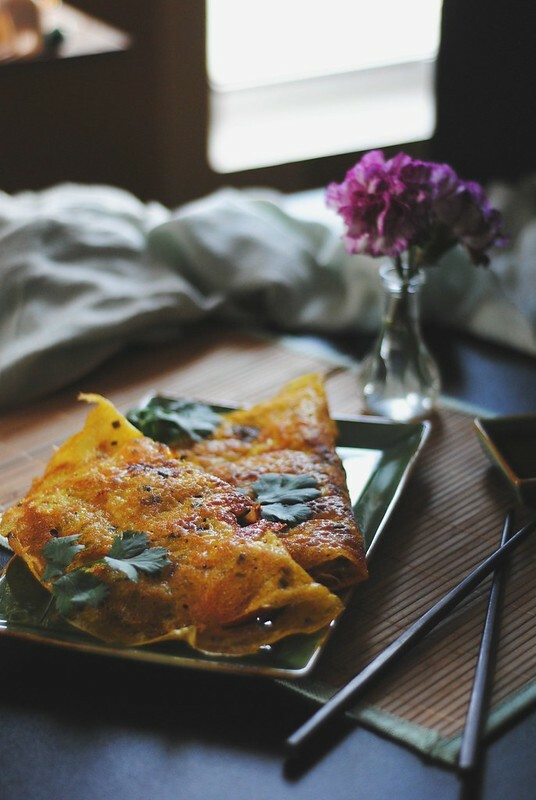 remove lid and allow the bánh xèo to cook through, get crispy around the edges, about 4-5 minutes. 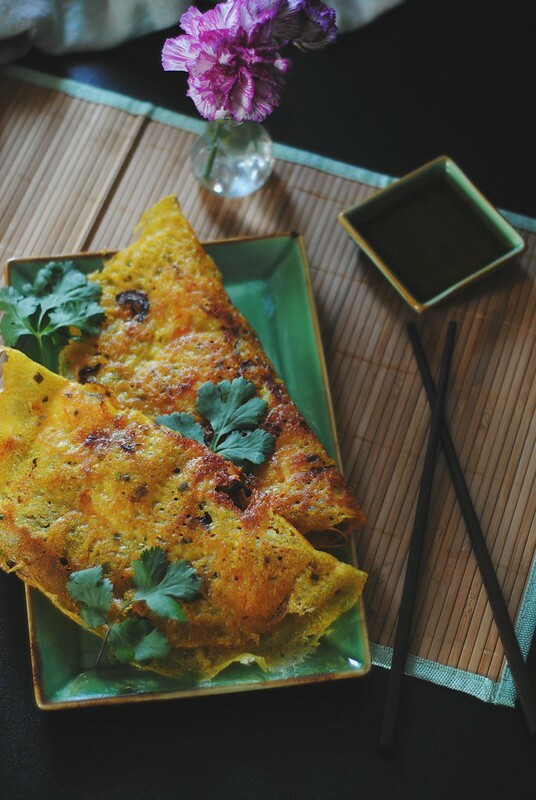 carefully, fold the bánh xèo in half, like omelette. i have no idea about that flour mixture but i will be on the look out for it..it looks so damn good!!! 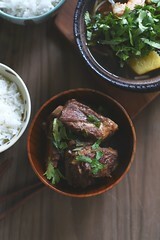 Love this dish Lan, and always look forward to your posts, your writing is very nice! cheri, as always you are too sweet! cynthia, you make me lol. These are beautiful. The mise en place directions are very clever and practical…fabulous idea! 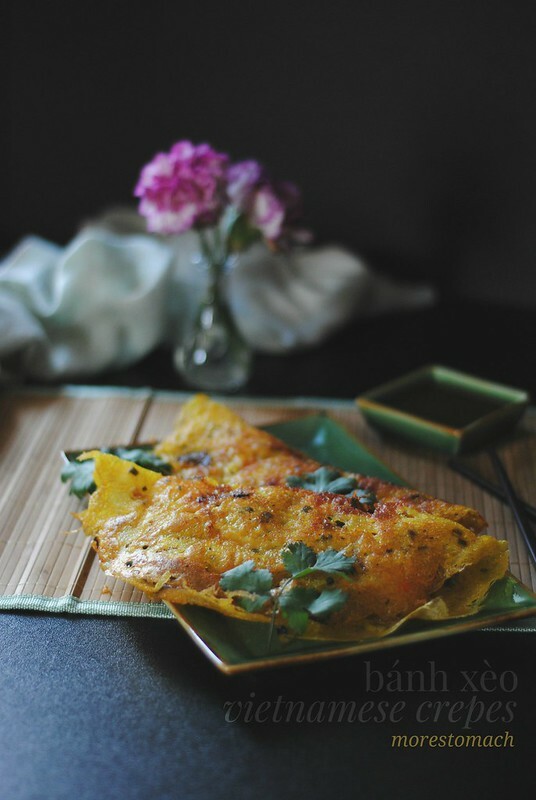 I’ll be on the look out for some of that banh xeo mix…do you think a Chinese market would have it Lan? yes, i meant to make note of which brand i got… in most asian markets (chinese, korean or vietnamese), in the flours/grain aisle will have a section with the pre-made mixes. just look for the term “bánh xèo” on the package. Oh my gosh! LOVE these, sound so delicious. So you just pour the batter over everything that’s in the pan already? Seems even simpler than banh cuon 🙂 I can’t wait to try! Love the turmeric hue…. reminds me visually of eggs but it must have the most unique texture. Go you guys, getting so much done in two days!! yes. but it really is up to you. 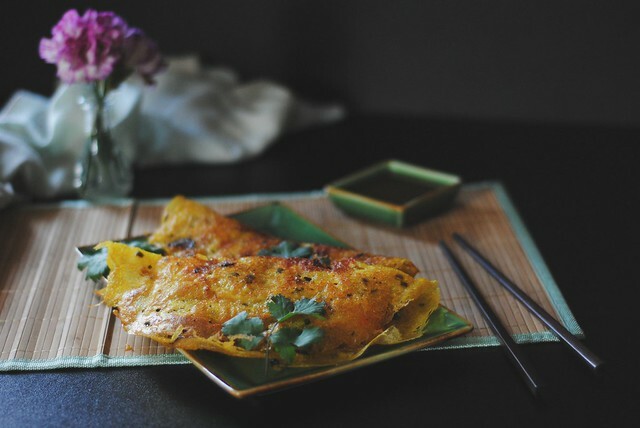 if you would prefer to not have your bean sprouts cooked through, add that just before you fold over the crepe.